Heavy rain and gale force winds are expected as the remnants of Hurricane Gordon reach parts of the UK. BBC Weather is warning of gusts of up to 70mph which could uproot trees, fell branches and cause structural damage in the worst-affected areas. Cornwall and West Wales are expected to be hit on Thursday before the so-called extra-tropical storm affects Northern Ireland and Scotland overnight. Ryder Cup organisers fear more bad weather may mean playing an extra day. The hurricane, which passed Portugal's Azores Islands in mid-Atlantic on Wednesday, has been losing power as it hit cooler waters. But its impact has been felt at the major golf tournament in County Kildare, Ireland. On Wednesday, organisers closed the K Club to spectators due to 40mph winds and have set Monday aside as a "reserve day" over fears that bad weather could delay proceedings. Meanwhile in Cornwall, surfers competing in a contest in Newquay were delighted at the prospect of 12ft high waves in the Atlantic. Earlier this week, people in the Azores were warned to stay indoors and keep livestock inside but damage was limited to toppled trees and power cuts on the eastern island of Santa Maria. The UK has seen similar storms hit it in 2000 and 1996. 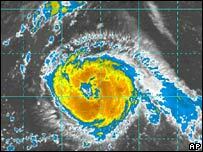 Mature extra tropical cyclone Lili, with gusts as high as 90mph, left a reported £150m worth of damage across the UK in October 1996.